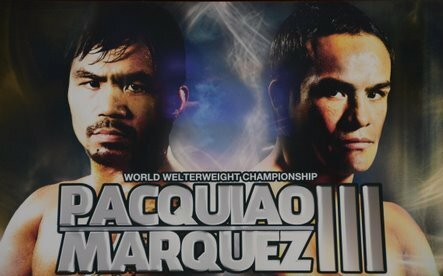 Boxing Channel offers you all the details of this week's events leading to Pacquiao-Marquez mega fight. Coverage can be seen at BoxingChannel.tv, hall of fame boxing broadcaster Al Bernstein was there to give you all the details of what happened during the press conference this past Wednesday, if you missed the weigh-in, watch the recap brought to you by Marcos Villegas, today we will bring you pre-fight material courtesy of Top Rank Boxing starting at 4PM EST; and of course tonight full and immediate coverage of the post-fight press conference following the fight. Go to the Boxing Channel right now and watch interviews with boxing luminaries,predictions by boxing celebrities, and a keys to victory feature from Al Bernstein. During the fight follow the Round by Round analysis in our sister site The Sweet Science, or follow us in Facebook and Twitter (@BoxingChannel) and (@TSSboxingnews) to receive updates and analysis of the biggest fight of the year. Log on to Boxing Channel and The Sweet Science after the match to get analysis and post fight interviews, commentaries and information, and if you want to share your opinion we have a space for you at The Boxing Forum. Para español, te ofrecemos nuestros sitios Canal de Boxeo y Zona de Boxeo, que te dan detalles de todo lo que ha sucedido durante la semana, y donde nuestro enviado especial Lazaro Malvarez te brindará hoy la mejor información desde Las Vegas. Igualmente durante la pelea estaremos brindándote análisis Round por Round en Zona de Boxeo y desde facebook y twitter, síguenos en (@ZonadeBoxeo, @CanaldeBoxeo). The Boxing Channel and its sister channel Canal De Boxeo are the only all-video channels on the internet devoted exclusively to the coverage of boxing. They are also the only channels to feature the exciting Forum boxing library. Juan Manuel Marquez is just one of the champions whose matches are available for viewing. All videos on The Boxing Channel are available on demand at no cost.